Can I Record/Download Music from Slacker Radio? Solved! Similar with Spotify service, Slacker Radio is a well-known online streaming music service with freemium and premium tiers provided. For Slacker Radio free users, you will be able to access to the whole Slacker’s music library and listen to music, radios and playlists with ads online. If you’d like to get the features, like listening offline, ad-free songs, unlimited skips, etc. you will be required to upgrade to Slacker Radio Plus or Spotify Radio Premium. As a Slacker Radio user, you might be eager to get a positive answer to the following question: instead of subscribing to Slacker Radio Plus for $3.99 per month or $9.99 every month to play on-demand ad-free music from Slacker radio offline, is there alternative solution to download Slacker Radio music for offline listening? Fortunately, the answer could be yes. To listen to Slacker Radio music offline with free account on Slacker, you just need to look for a professional and powerful Slacker Radio recorder and downloader that can help you record Slacker Radio with zero quality loss. 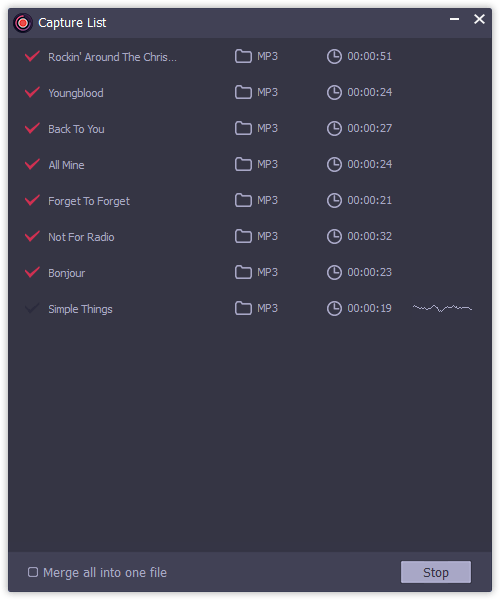 In this article, we will introduce such a tool for Slacker Radio and show the detailed tutorial on how to record Slacker Radio as MP3 offline. There are lots of audio recorders and downloaders well-designed for streaming music services. When it comes to the best performance, such as high-quality output audios, special functions, ID3 editor, etc. 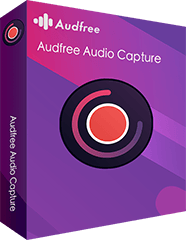 AudFree Audio Capture could be put in the No.1 place. By adopting innovate and advanced audio capturing technology rather than traditional audio recording technology, AudFree Slacker Radio Recorder has the ability of recording and downloading music from not only streaming music services, like Slacker Radio but also video sharing sites like YouTube, local media players, online radio stations, etc. Besides, it is also an all-in-one audio converter, which can convert Slacker radio to MP3, FLAC, WAV, AAC, M4A and M4B without touching original audio tracks. 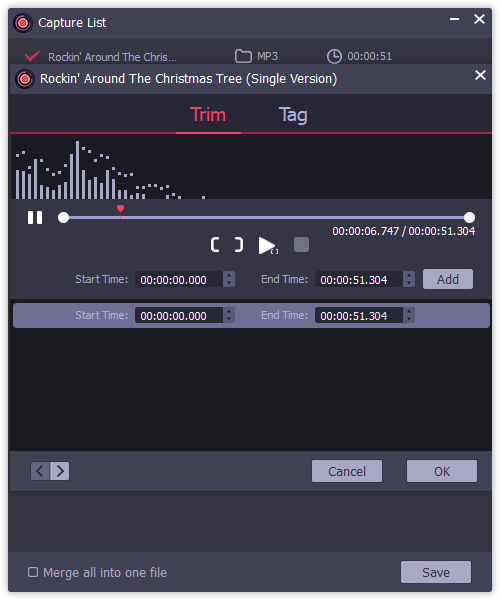 With its built-in ID3 editor, you will be able to customize ID3 tags, such as year, title, cover, and other audio parameters, like bit rate and sample rate in the accordance with your special requirements. Losslessly download music from Slacker Radio, Spotify, etc. Convert recorded Slacker Radio to MP3, AAC, WAV, FLAC, M4A, etc. 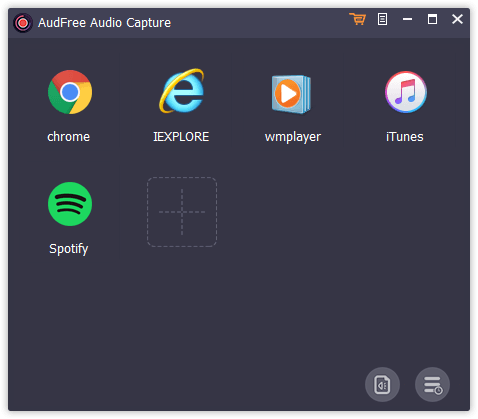 To record audios from Slacker Radio, please download and install AudFree Audio Capture on your computer, which will pop up a detailed guide on using Audio Capture. You can refer to that instruction or directly follow the below tutorial to record and download Slacker Radio as MP3 with almost 100% original files preserved. 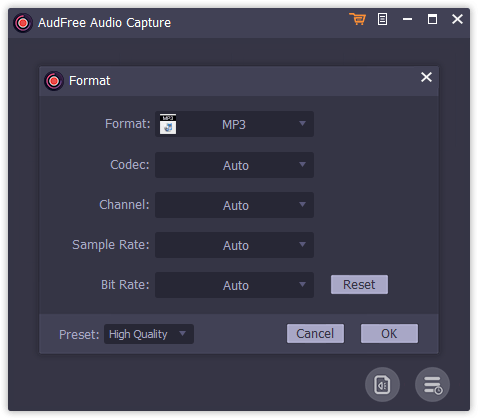 After you installed AudFree Audio Capture on your computer, please launch it to set up the recording settings. In the main interface, you will see there are a list of installed programs on your computer. You need to do is to check whether the web browser you used to access to Slacker Radio is here. If not, please drag it from your computer desktop or click ‘+’ button to add it to AudFree software. There is an ‘audio’ icon at the bottom-right corner of the main window, please click it to launch the setting window. And then you are able to define output format as MP3 to export Slacker Radio music as MP3 and customize other audio parameters, like bit rate, sample rate, audio channel, codec to enhance the audio quality for better listening experience. Go back to the main interface and select the target web browser, like Safari or Chrome. Once opened, please type the link address of Slacker Web Player to navigate to Slacker Radio. 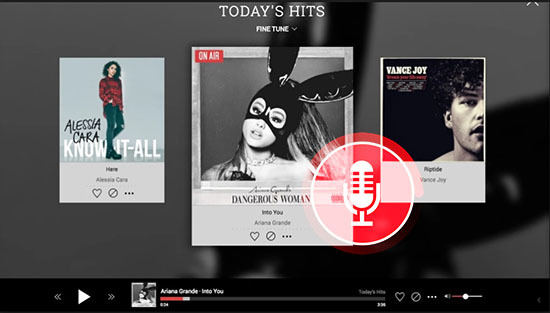 Now, you can start to discover favorite songs and playlists on Slacker Radio and play them. At the same time, this smart audio recorder will launch its recording mode automatically to record and download Slacker Radio music. When all songs in Slacker Radio that you’d like to listen to offline are downloaded and recorded successfully, you can hit on the ‘edit’ button (at each recorded track) to launch editing mode, in which you can cut Slacker Radio playlists into smaller audio segments and customize ID3 tags, etc. After that, please click the ‘Stop’ > ‘Save’ button to save all offline Slacker files on your computer. No matter you are using Slacker Radio free account or premium account, you can use AudFree Audio Capture to get better Slacker music playback. For free users, you can record Slacker Radio music for offline listening without interruption of advertising. For premium subscribers, you can download playlists from Slacker Radio to MP3 so that you can transfer them to any other device for playback. Now, it’s time for you to record Slacker Radio songs as MP3. After that, you can listen to them anywhere and anytime.